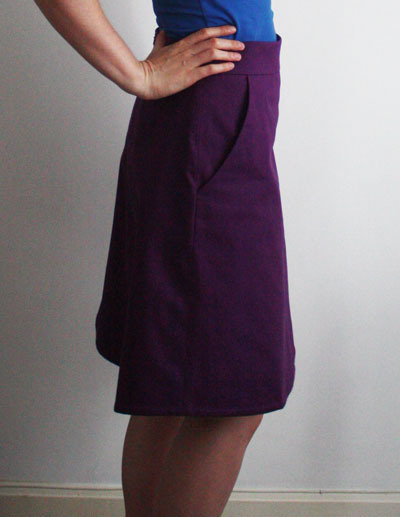 For my next skirt I thought I’d go a-line – clean and smoothly fitted around the waist but more room for movement than a pencil skirt, and hence much more likely to get worn. The Colette Ginger skirt gets pretty good reviews and I thought the instructions for their Sorbetto top were excellent, so this looked to be the clear choice. I also liked the fact that it uses clever shaping instead of darts. Anyway, the main downside of the pattern was no pockets, but that’s one of the big joys of learning to sew – I can adapt the pattern to suit me! I was particularly inspired by this version with side slant pockets (I also really like her use of piping and was tempted to add that too, but decided to leave that for another version). I used the pocket pattern pieces from the first trouser pattern of Dressmaking: The complete step-by-step guide as a starting point. Those slant pockets were straight but a lot of similar pockets I’d seen on skirts were curved, so on my toile I made one side pocket straight and the other gently curved to see which I preferred. The curved version was definitely better as it sat flat against the body while the straight pocket stuck out and distorted the skirt shape. For a fun hidden detail I used some of my London fabric for the pocket lining. I found it amazing how much of a difference just a small adjustment can make – initially I was getting some very unsightly diagonal lines from the centre back out towards the side hem, but lengthening the centre back seam by just 0.5cm sorted this out. The fabric is a cotton drill from Goldhawk Road. It is fairly thick and sturdy so not entirely sure it was the best choice for this skirt as the waistband stays upright and thus gapes at the front when I sit down. I love the colour though. 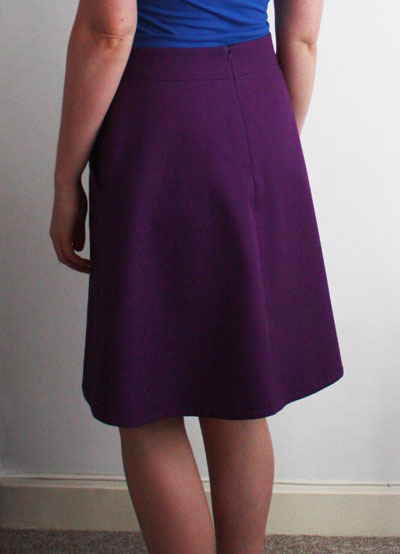 I wanted this to be a skirt for all seasons, so as I was making it up I tried it on with tights – as soon as I started to walk I could feel it doing that annoying climbing up the legs thing, so the skirt had to be lined. 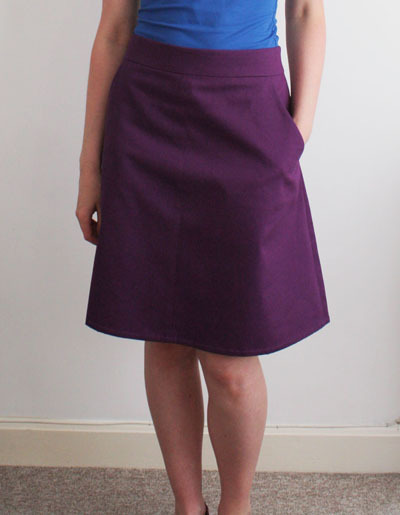 The lining is acetate from Goldhawk Road that I already had as it was originally intended for a cord skirt (that I won’t make before the autumn), but I liked how the colour worked with the purple shell. It was a nightmare to sew! I now know what people mean when they talk about fabric slipping all over the place. I hand basted every seam before taking it to the machine which seems to have worked, well enough for a lining anyway. For the invisible zip, I referred to Sunni‘s Craftsy zipper class and Lauren‘s Invisible zipper tutorial along with the pattern instructions and am pretty happy with how this turned out both on the outside and inside. The zip isn’t completely invisible at the waistband join, but I think this is due to the fabric being so thick. I’ve since noticed that a lot of more experienced bloggers don’t use invisible zips with thicker fabrics, so I’ll remember to use a regular zip with such fabrics in the future. 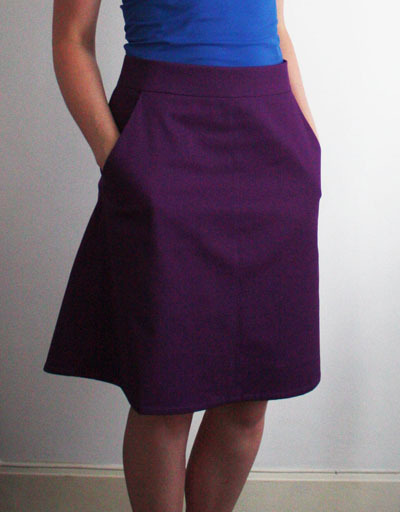 This skirt actually took quite a long time to make with all the pattern adjustments and figuring out how to work with the slippery lining, but I’m very happy with how it has turned out. Despite loving the colour and the finish, sadly I don’t think this is going to become a frequently worn skirt as it just feels a bit too stiff (hopefully it will feel so bad in colder weather), but I’d definitely use the Ginger skirt pattern again with a different fabric. I’d like to try out the bias cut version too in order to create the chevron effect, especially after seeing Caroline’s lovely version. 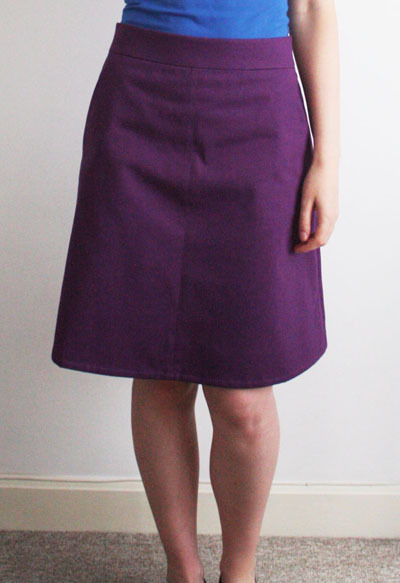 Love your new purple Ginger skirt Alex.The colour is lovely on you, it would be a shame not to wear it with some tights and some chunky boots this Autumn. I am looking forward to your next bias cut version – have you selected your fabric yet? Thanks for the shout-out about my chevron Ginger – that took way longer than I anticipated getting it cut out. Worth it in the end though. I agree with the waistband slightly gaping upon sitting – my first version in cerise medium weight cotton tends to do that. I hoped it may soften up in the wash but it hasn’t. 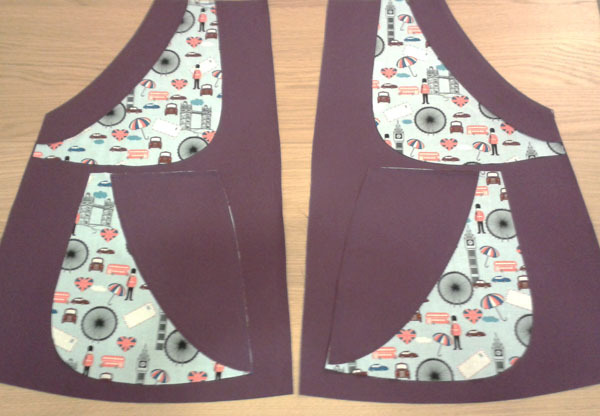 I also think on my version the interfacing may add to the overall stiffness of the waistband. Good luck on Ginger version two! Thanks Caroline. 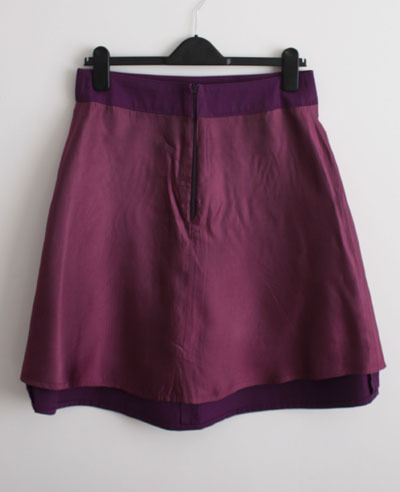 Yes, hopefully this skirt feels nicer to wear in the Autumn. I think I’ll work on another grain cut (is that even a term?? 🙂 ) skirt or two before attempting a bias cut version, or it may be sooner if I see striped fabric I love (not selected the fabric yet). I love the many-colour stripes in your version, so I suspect I’ll be keeping an eye out for something similar!